The SealSmart Coax Cable Stripper from Platinum Tools is designed for RG6 quad cables and pre-set to a specific strip length so you can quickly remove the jacket and the correct amount of shielding. It is colored blue to coordinate with Platinum Tool's SealSmart compression connectors. Furthermore, it features a two-level stripping system for leaving 1/4" braids. Box Dimensions (LxWxH) 5.7 x 2.4 x 0.5"
SealSmart Coax Cable Stripper for RG6 Quad is rated 5.0 out of 5 by 1. Rated 5 out of 5 by Thomas from Best stripper for Quad Shield cable I have used many strippers for coax, but this tool made it easy! 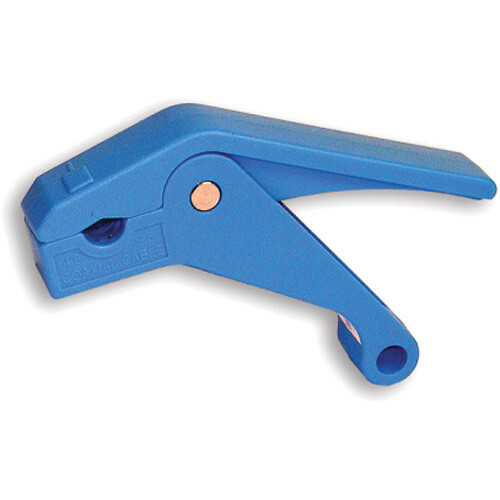 The Platinum Tools 15021C SealSmart RG6Quad Coax Stripper, (Blue) gives fast, accurate stripping right out of the box.